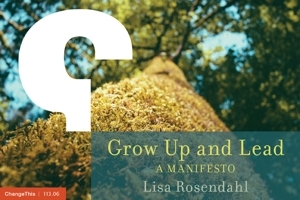 Lisa Rosendahl — Do You Read HRMagazine? This is a cover of the latest issue of HR Magazine. Do you read it? I don't. When HRMagazine is delivered each month, I glance through it to catch the quote boxes and side bars on my way to staff mailboxes to route to my staff. Many of my staff read it cover to cover. I used to read HR Magazine. Early in my career, my interests were in developing a solid foundation of "how to" and "why we have to" and SHRM resources were life-saving to me. I had web pages bookmarked, white papers document protected and the knowledge center on speed dial. I read HR Magazine cover to cover and dog-eared page after page. My interests now are on the broader role of HR in providing leadership and on engaging in real time discussions with others about emergent issues. HRMagazine is solid and meets a real need but it is a magazine for the masses. I am in search of the niche. I want real-time, speed-of-light, broad-range-of-perspective kind of interactions. I look to the 50+ blogs in my Google Reader, Alltop, HR networking sites HRM Today and HR Presence Network and, of course,Twitter for my daily fix of interaction and information. I am a card carrying SHRM member. Yes, I am a expectation meeter at heart, but I don't maintain my membership year after year to make others happy. I maintain my membership each year because, as Laurie at PunkRockHR so finely stated, "there are tremendously talented men and women who work to make HR a more credible and visible profession." So, do you read HRMagazine? Why or why not? China Gorman, SHRM COO, is on Twitter and she really wants to know. Won't you share your thoughts with her?